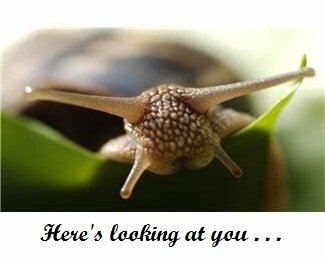 Do the slugs and snails in your garden have eyes-bigger-than-stomach syndrome? Do whole seedlings disappear in a night? Read on for expert slug and snail control. . .
Slugs and snails are gastropods (meaning stomach foot), which belong to the mollusc species. Most molluscs have shells, like snails. A slug's shell is hidden inside itself and is very small. You'd have to say these gastropods are not the most sporty or elegant creatures, but snail shells can be quite spiffy looking and slug colours don't just come in standard garden grey/brown. Snails have a kind of teeth or rough tongues like files or razors. They saw around the edge of leaves or eat whole baby leaves. Slugs more often eat holes in leaves as well as whole baby leaves and even tender roots also. Snails need calcium carbonate to build their shells, so are not usually found in sandy soils. Garden or wild snails prefer damp, vegetation rich environments. Where snails are farmed and used for eating, particularly in western Europe, they are given a careful diet of various vegetables and meal. They are a delicacy to eat. Not slugs...ugh. Some birds, especially blackbirds and thrushes love them as food. Also moles, chipmunks, ground beetles, hedgehogs and other wildlife like to eat them too. BUT if it's between you or a tsunami of slime-balls (as some people call them), then I guess it's handy to have ways to deal with them that work! Do a night patrol with a torch/flashlight. The best time is dusk or early morning, especially when it's damp or raining. Don't use your hand to pick slugs up—it's horrendous trying to get that sticky stuff off. Should you get slimed by mistake, rub vinegar on hands and rinse with warm water. Scoop them up with an old spoon, dump them in a high-sided bucket and scrape them out somewhere where they won't be a pest. A new home in a compost bin or across the road in a wild patch or park will be a humane way to treat them. If there's nowhere else for them but kapow*@!! ... give them a quick stamp with your shoe, or drown them in soapy water or salty water. For more instant killing power, just sprinkle lots of salt on them or squirt with ammonia. They will patrol along, following each other, in search of tasty slugs and snails. Best to set them a-feasting when you have the garden ready for planting, and before new seeds and seedlings are in place, otherwise they will peck at tender leaves or plonk their feet on them. A temporary fence is useful, or a moveable cage that can be wheeled or pulled along into areas where these birds can scratch through the soil and any vegetation, and fertilize as they go. Supposedly if you sprinkle crushed egg shells around vulnerable plants the slugs and snails will avoid crossing the sharp shells. To be crystal clear here, there is no reason this will work... there are videos of snails sliming along a razor blade! Believers of eggs shells' deterrent ability will swear it works. However, as slugs and snails don't like dry conditions it's possible that a large layer of dry crushed eggshells should be uncomfortable for them and make them go elsewhere. Children like to help here, they love crushing eggshells. Keep them in a jar until you have enough to use. Make sure they are clean and dry first, otherwise rodents will come sniffing. Sharpish and salty, save your shells after eating any salted nuts, but especially pistachios, and put around your young plants. Slugs and snails seem to find these pretty hard to cope with. Leave the shells and in time they will rot down nicely. This is dense and unattractive to slugs and snails and they will avoid crossing it unless they are starving. Another dislike of snails is sand, which they do not like to cross as it's dry and barren. Put a band of fine sand about 1cm (¼") high around the garden edge or base of plants. As above, put an edge around your plants to deter them. Don't use these excessively as they eventually harm the soil. Ash alkalizes your soil and salt harms plants. Best to make a channel above the soil, such as a wide hose or some guttering with the top third cut off and filled with ashes or salt. Any material whereby you can contain the powder in a channel will work; tin, plastic half-rounds and so on. This is now sold at gardening suppliers and is useful, and yes it works, but it's best to use for areas where you don't want other beneficial insects harmed, such as dealing with fleas inside. DE is a pale, powdery substance, originating from fossilized single-celled algae called diatoms. Their silicon skeletons are very sharp and insects that have soft bodies and come in contact with DE, or eat it if it is combined with a tasty bait, will get cut, dehydrate and die. Powdered glass anyone? It is organic but not harmless. Like many natural insecticides or pesticides, it's not specific in its victims, so don't scatter it willy-nilly over your garden. It's no problem for us or pets, but because it is a fine powder be careful you don't breathe the stuff in. If you are a handy-person, look up ways to run an electric wire, (the hose idea above is good for this wire). Basically, electric contraptions are very simple setups involving conductive wire, a low voltage fence unit or car battery. Another supposedly it works idea. Copper and snail or slug slime don't mix, which means snails will avoid going over a copper strip placed on the ground... which means they will also avoid your growing food, ah ha. A reasonably wide copper barrier is needed, even up to 15cm (6") so that large slugs or snails can't hump across it without touching the copper. It can be copper mesh or a flat copper strip or flashing. Lay it on the ground and peg it down if necessary or stand it up vertically and peg in place. It maybe that they don't like the shiny open surface, rather than any chemical re-action. This is useful for container gardening and one application lasts for years. Simply smear around the edge or sides of plant pots, raised garden beds or cold frames, and there's no way slugs and snails will cross this barrier. Some people add salt, ginger powder or cayenne pepper to the jelly. It's also a useful tip for using when you have small bottle cloches over your seedlings or newly planted zucchini/vine plants. This can be used on the ground or tacked around container plants as well. Snails often get caught in the act, just like a burglar. The snails try to crawl through the netting but their shells get stuck. You can then extract them in the morning and re-locate them to a new home. Orange or grapefruit halves hollowed and turned upside down placed around the garden will also attract snails and slugs. Go out in the morning to remove or deliver the coup-de-grace on those hiding under the peel. ...Best done on a damp or rainy night. Place a folded heavy cloth or tarpaulin on the ground near your most snail delicious plants and in the morning, stamp over the top of it, crunching snails as you go. Planks or pieces of cardboard raised slightly above the ground by small stones or sticks can be used and dealt with the same way. Yum yum... slugs and snails slither quickly towards the wafting smell of yeast, so beer does the trick here. Settle a large lid, container or tin with the rim at near ground level, and pour in a good 2-3cm (1") of stale beer... or cheap new beer if you're not a beer drinker. Make sure there are a few centimetres of space from rim to beer so they have to actually crawl in to get to the beer. It's effective, although a bit of a messy operation—you need replacement beer every few nights, especially if it has rained, and you have to tip out the sozzled, dead corpses. Of course after a little while, you will have drowned most of the snails and slugs in your garden, so do what many gardeners do and place a few beer traps outside your garden, so that you're not attracting new slugs and snails with the smell. Try and place a cover over your beer traps and peg or fasten it down, leaving a snail-sized entrance. There are many stories of dopey hedgehogs and happy dogs romping around gardens in mornings, knocking over plant pots. Putting down near empty beer bottles with their necks flush with the ground is a solution as long as the neck is wide enough for big snails. Similar to above beer traps. It may be the fermentation or the sweet aroma that attracts them most. 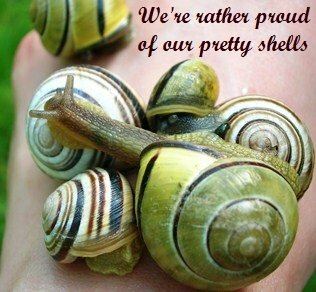 You may have snails and slugs with different taste preferences and one bait works better than the rest. Just a warning about lizards and frogs; if you have these in your garden, be careful you don't drown them by this method. Use a different control if this is likely. Also known as ferric phosphate, this popular and effective slug and snail bait is sold as organic under names such as Garden Safe Slug & Snail Bait, and Sluggo and other commercial names. Iron phosphate is a naturally occurring fertilizer which breaks down into natural soil nutrients, iron and potassium. For slug and snail bait it is mixed with bran, oats or gluten as an attractant. 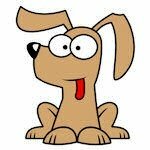 Potentially it can also poison pets, birds, lizards and people including children, but it requires very large doses to do any harm. Although the iron content is natural and inert, a small amount of a chelating chemical called EDTA, is also added, which then enables the Iron Phosphate to be released into the digestive system of whatever eats it. 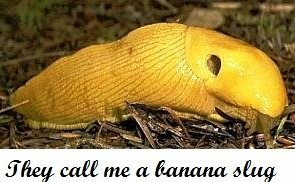 This acts as an effective poison, but unfortunately it has now been found that it can harm earthworms, but only if it gets into the soil. When researchers experimented with various sacrificial methods to lure pests away from valuable plants, red clover proved best. Slugs love red clover. Ornamental gardeners regard it as weed and try and eradicate it from their lawns! Farmers and veggie growers recognise its nitrogen fixing properties as a legume and grow it as a cover or fallow crop. 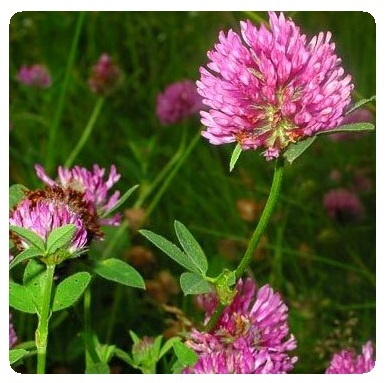 Easy to grow, red clover is a hardy, but short-lived perennial which often propagates itself by seeds. Plant a strip of beautiful red clover near your garden to lure the slugs away. Makes great nitrogen-rich organic matter as it fades, and you can let another fresh crop grow nearby. Red clover also has medicinal uses, and the flower petals are edible—hip cool to toss in salads. Planting a row of green loose-leaf varieties of lettuce, will hold slugs and snails back from delving further into your garden. It seems hard to sacrifice lettuces, but with leaf varieties they keep on producing leaves even if the middle has been munched at, so some for you and some for slugs and snails—it's a win win. 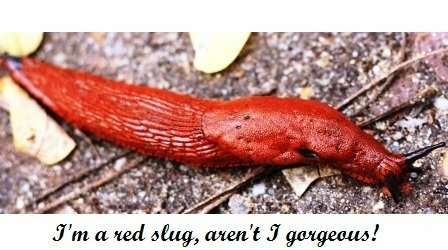 Some people give remarkable accounts of slugs disappearing when they've stopped using a coarse, dry type mulch, especially straw. Sounds amazing, but as the sun comes up, apparently slugs love nothing better than straw to settle down into and sleep off their dinner of your lettuce seedlings! The solution is to use compost mulch instead of straw. Too simple. . . well it is, although straw is usually cheaper and easier to obtain and does a great job of stopping weeds and help keeping the soil at a good temperature. Also many gardeners don't always have left over compost to put a layer on top around their plants. But it's worth it if it solves your slug problem. The compost will also eventually provide nutrients for the next crop. Spent coffee grounds are not strong enough to be toxic. Even a strong coffee brew sprayed onto plants has found to be ineffective. Possibly slug and snail babies and eggs over-wintering in the soil are harmed by coffee, but otherwise the coffee grounds around plants act as a very mild deterrent to these slithering creatures. Sprays like Garlic fire don't work with slugs and snails—they are molluscs, not insects. There are a host of unproved methods and myths in the garden world. The pest control strategies here have all shown their mettle. There are some methods not mentioned here that have shown promise, but they are either horrendously expensive or equally horrendously complicated, time-consuming or dangerous to be worth the bother.